In response to story a mother from mainland China helping her boy urinate into a trashcan at a Hong Kong subway station, last month I shared a photo of a "no peeing" sign I recently saw in Macau, China. As I later mentioned, many times in China I have seen an adult helping a small child urinate in a public place such as a sidewalk. Although I didn't expect to return to the public urination & subways topic, yesterday my friend Chiaki Hayashi Kato shared a photo of a sign which I think deserves being added into the mix. She saw the sign in Xi'an, the capital city of Shaanxi province best known for its famous Terracotta Army. In contrast to its bounty of historical treasures, Xi'an has recently experienced several forms of modern development including the addition of a new subway system. The first line opened in 2011 and a second line began running two months ago. Building a subway system is one thing. Teaching people how you want them to use it is another. According to the Xian Metro's website (Chinese), a variety of campaigns have been carried out to influence passengers' behavior, such as instructing people to stand in line for arriving trains and cracking down on people who are eating or drinking. A current campaign even offers rewards for photographs of "uncivilized" behavior. All subway stations have toilets. Please don't allow children to urinate or defecate inside the subway cars. I didn't ask Chiaki, but I feel confident she followed this advice without much inconvenience. And based on her comments, she didn't witness other people not following the advice, so I guess she won't be receiving a reward soon. 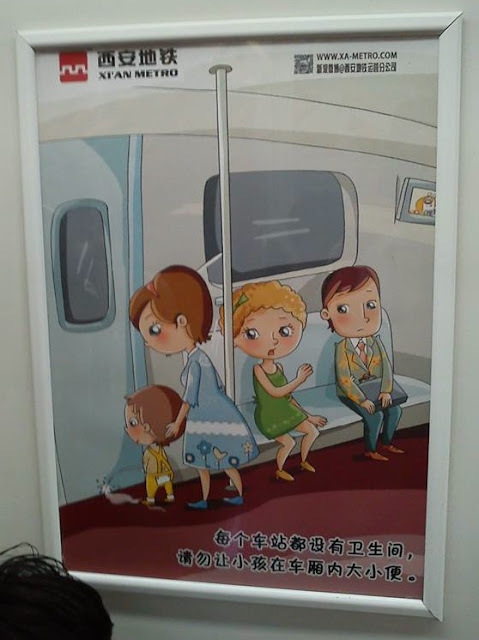 Children (and sometimes adults) urinating or defecating on floors while using public transportation may not be best described as "common" in China, but, as an online search will show, it happens. The sign directly confronts an issue that can be uncomfortable for some but difficult to address without drawing more attention to it. If the Xi'an Metro wants its subway cars to be urine-free and excrement-free, the sign strikes me as a rather pragmatic and somewhat colorful attempt to improve the odds. And if the sign is part of an effective campaign, the benefits should outweigh any negative perceptions related to people wondering why such a sign is needed in the first place. It's a common enough phenomenon where I roam. I do want to also point out that this is primarily a graphic admonishment. Does that also hint at the likelihood that those who need this message are also illiterate, or at least, in the minds of those who have printed this poster. What can you also add, seeing that these characters do not look at all like their intended viewers?